The church of Ladykirk, originally dedicated as Our Lady Kirk of Steill, is said to have been built during the last years of the 1490s on the orders of King James IV of Scotland. On returning from the siege of Norham Castle in 1496, King James IV is said to have fallen from his horse into the Tweed. He attributed his survival to the intercession of the Virgin Mary. Ladykirk is a fine example of late Scottish Gothic architecture, grander than its location required because of its royal patronage, and now home to a bust of King James IV. It is one of the few stone roofed churches in Scotland. Ladykirk as we see it today was constructed on the orders of King James IV of Scotland during the closing years of the 15thCentury. The presence of early burials under the walls of the current building suggest the existence of an earlier church on the same site. James originally dedicated the church as Our Lady Kirk of Steill and is said to have lavished his attention on what otherwise would be an ordinary parish after he survived an accident as he crossed the River Tweed returning from his siege of Norham castle in 1496, narrowly avoiding being drowned. James is said to have believed that he was saved by the Virgin Mary and ordered the church rebuilt and dedicated to her, to give thanks for his survival. The building that resulted is said to be a fine example of late Gothic Scottish religious architecture characterised by its cruciform plan, curving apse with its fan of buttresses all capped by stone pinnacles, its semi circular arched doors and by its stone flagged roof. Work was started by Sir Patrick Blacader and was well underway when James visited the site in 1501 when, in honour of his visit, the organ was installed. Blacader remained in charge until 1504 when he was replaced by George Ker of Samuelston, though by this time the windows were being glazed so generally the construction was well advanced. James’ personal investment in the project can be seen from his accounts where the building costs were listed in the same headings as his royal palaces and the Scottish Navy. During the Flodden campaign there are no direct references to the church being involved in events, but it is hard to believe that as the Scottish Army besieged Norham Castle for 5 days during the last week of August 1513, James did not take time to visit the site and in all likelihood pray to the Virgin whom he believed had already saved his life on a previous occasion in 1496. Local tradition has it that the fields between the Church and the Tweed were the site of the artillery positions for both the 1496 and the 1513 sieges of Norham Castle and that earthworks that survive in these fields are the remains of the gun platforms from these actions. Famously one of these gun emplacements is said to have been prepared for Mons Meg, which is known to have bombarded Norham in 1496 but was not present in 1513. There is however some question over the practicality of this amongst today’s local historians. In practical terms, the range from the top of the northern bank of the Tweed by Ladykirk to Norham Castle is 1 mile, and the range of some of James’ largest weapons, particularly his grose and demy culverins, was of this order. So perhaps this position with its line of site to the main, western gate of the castle and parity in height offered a useful location for the two grose culverins with which James is said to have left Edinburgh in August 1513. It is also worth considering how these fields offer control over the major fording points of the Tweed that lie to the west of the current bridge and if artillery was placed close to the church it may have been to support the assault on the castle by maintaining control over this vital route. 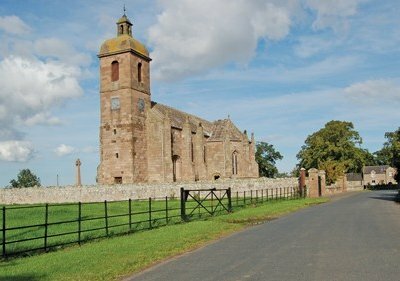 While today there is no immediate access to the remains in the fields to the south of the church, the Norham and Ladykirk History Society hope to investigate these remains in coming years. The location of the church close to this fording point also led to it being a meeting place for cross border conferences. In 1551 the gentlemen of Selkirk, Duns and Jedburgh were summoned here to meet Mary of Guise, mother of Mary Queen of Scots, on her return from France. 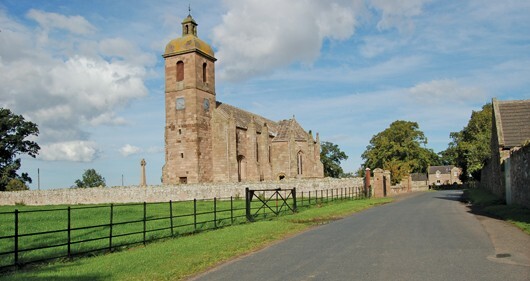 In May 1559 the Treaty of Upsettlington was agreed here and exchanged in Norham Church by the Earl of Morton, Alexander Lord Hume, Henry Sinclair, the Dean of Glasgow and James MacGill of Nether Rankeillour on behalf of Mary Queen of Scots and Francis II of France and by The Earl of Northumberland and Bishop of Durham on behalf of Queen Elizabeth. James IV’s work on Ladykirk was never apparently completed, perhaps due to his untimely death in 1513, with the circular stair tower attached to the main tower only being completed during the mid 18thCentury. While there is no documentation concerning this work some have linked it to the famous Scottish architect William Adam. Ladykirk is a Listed Grade A structure. Parking on the verge close to the churchyard. From Coldstream - take the A6112 from Coldstream east though Lennel. After 1.5 miles turn right on the B6437. Follow the B6437 for 3 miles until you reach a cross-road. Turn right onto the B6470 (to Norham) and follow the road for 1 mile taking the second left turn, for Ladykirk. Follow the road for a further 500m, until you reach the church on your left. From Norham - follow the road west away from the village green through the village and over the Tweed. The road rises steeply on the north (Scottish) bank. At the top of the hill after 250m turn right to Ladykirk and follow the road east for 500m, until you reach the church on your left.